L4Linux has been updated to Linux-4.19. L4Linux has been updated to Linux-4.18. L4Linux has been updated to Linux-4.17. L4Linux has been updated to Linux-4.16. L4Linux has been updated to Linux-4.15. L4Linux has been updated to Linux-4.14. After a longer break, L4Linux has been updated to Linux-4.13. L4Linux has been updated to Linux-4.7. L4Linux has been updated to Linux-4.6. L4Linux has been updated to Linux-4.3. Support for x86-64 has been added. L4Linux has been updated to Linux-3.16. Version 3.15 has been left out this time. L4Linux has been updated to Linux-3.14. L4Linux has been updated to Linux-3.13. L4Linux has been up'ed to 3.12. L4Linux for Workgroups is there (aka L4Linux-3.11). L4Linux based on Linux 3.10 is available now. L4Linux has been updated to Linux 3.0. L4Linux has been updated to 2.6.39. L4Linux has been updated to 2.6.38. The L4Android projects runs Android on top of on Fiasco.OC, L4Re and L4Linux. Refer to the project site for more information. L4Linux has been updated to 2.6.37. L4Linux has been updated to 2.6.36. L4Linux based on Linux 2.6.35 and running on L4Re available. L4Linux based on Linux 2.6.34 is running on L4Re. 2.6.32 and 2.6.33 were only available internally. 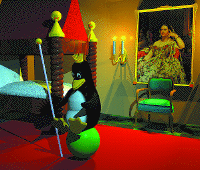 L4Linux was updated to Linux 2.6.31. L4Linux was updated to Linux 2.6.30. L4Linux is now based on Linux 2.6.29. L4Linux is now based on Linux 2.6.28. L4Linux is now based on Linux 2.6.27. L4Linux is now based on Linux 2.6.26. L4Linux is now based on Linux 2.6.25. L4Linux is now based on Linux 2.6.24. L4Linux is now based on Linux 2.6.23. L4Linux has been updated to 2.6.22. L4Linux has been updated to 2.6.21 and is now available in the subversion repository. L4Linux has been updated to 2.6.20 and is now available through our subversion repository. L4Linux has been updated to 2.6.19. L4Linux has been updated to 2.6.18. L4Linux-2.6 based on 2.6.17 is now available. L4Linux-2.6 based on 2.6.16 is now available. L4Linux-2.6 based on 2.6.15 is now available. L4Linux-2.6 based on 2.6.14 is now available. L4Linux-2.6 has been updated to upstream version 2.6.13. L4Linux-2.6 has been updated to upstream version 2.6.12. L4Linux-2.6 has been updated to upstream version 2.6.11 and an ARM port has been added. L4Linux-2.6 has been updated to upstream version 2.6.10. L4Linux-2.6 has been updated to upstream version 2.6.9. L4Linux-2.6 for L4Env based on Linux 2.6.8.1 is now available via anonymous CVS. For downloading refer to the download page, see it in action or try it yourself. This release is not ready for performance assessments and still awaits improvements in some regions but is nevertheless stable enough to run most of the available programs. L4Linux-2.4 has been updated to upstream version 2.4.27 of Linux. L4Linux-2.4 has been updated to upstream version 2.4.26 of Linux. A frame buffer driver for both DOpE and con is now available. L4Linux-2.4 has been updated to upstream version 2.4.25 of Linux. L4Linux/ia32 has been updated to version 2.4 of Linux! The latest patch is against 2.4.24. L4Linux now runs on V.2, X.0 and X.2 µ-kernels (Fiasco, Pistachio). Additionally it is now possible to run L4Linux as an L4Env application adding some interesting features. Get your copy in the download section.